With just a little over a month remaining until Pitchers and Catchers report to Spring Training for the Yankees, it’s imperative that we continue to discuss the young players that may have a big impact on the 2015 season. 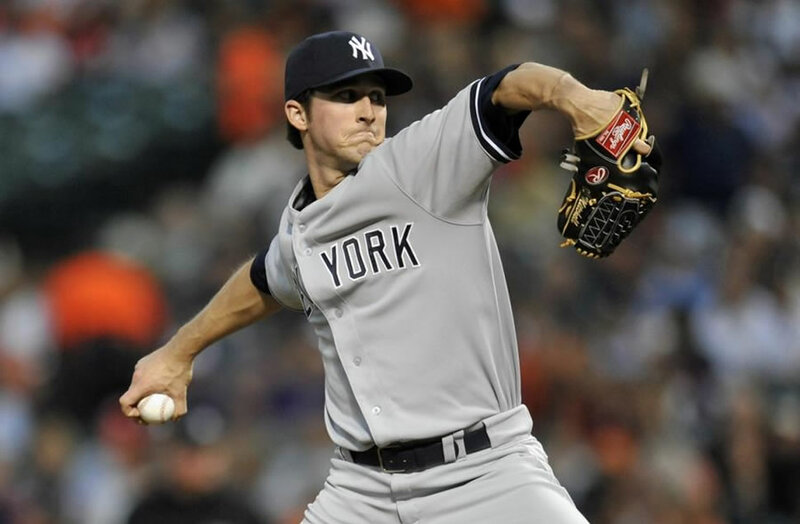 Today, we’ll take a look at Bryan Mitchell, a right hander that made his Major League debut for the Yankees last season, and could end up with a role in the bullpen, or in the rotation, at some point in 2015. Let’s find out more about the young lad. The Yankees drafted Mitchell out of high school in the 16th round of the 2009 draft, so he’s now entering his seventh year with the organization. He worked his way through the system steadily, making it all the way to AAA last season, where he went 4-2 with a 3.67 ERA and ended up getting called up to the bigs, despite a FIP over 4 (the Yankees rotation was in shambles, to say the least). He made his Major League debut in relief on August 10th against the Indians, pitching 2 scoreless innings. He was sent back down, but recalled in September for a spot start against the Orioles. In that game, he held the O’s powerful attack to just 2 runs on 6 hits while walking 2 and striking out 2 (his first MLB strikeout was against Delmon Young, if you’re curious). He made one more relief appearance in September against the Sox, leaving his season record at 0-1 with a 2.45 ERA. Small sample size, but it was good. Scouting reports for Mitchell aren’t exactly glowing, but they’re certainly not bad. He has a fastball that tops out in the mid-90s, and a nasty curve ball that he often uses as his out pitch. The curve is very sharp, almost like a slurve, which makes it harder to hit. He does also possess a changeup, but it is very unpolished, leaving him with basically only two pitches. Typically, this would make him more suited for a bullpen role, but the Yankees have so many young and talented relievers, that Mitchell’s best chance to contribute will probably come if and when a member of the starting rotation gets injured. I could definitely see a scenario where Mitchell starts the year in AAA Scranton, pitches well and gets the call because Sabathia’s knee finally crumbles. If that’s the case, he has the potential to be this year’s Shane Greene… or, less desirably, this year’s Chase Whitley. Either way, we’ll definitely see Mitchell as one of the first spot starters/starting rotation injury fillers of the 2015 season if he’s pitching well in AAA. He might lose out on that first call up to a guy like Jose De Paula, but he won’t be too far behind.